If you're of a paranoid disposition, you're probably warning yourself right now that this article runs the risk of discussing something gruesome, such as sausage made of puppies. "Oh my god," you might be thinking, "is that what they do with the Puppy Bowl puppies after the Puppy Bowl? They turn them into sausage?" No, they don't — stop being so macabre. This article has nothing to do with the dark world behind the manufacture of puppy sausage. That's a topic better left to a 60 Minutes expose featuring Leslie Stahl and a lot of blacked-out puppy meat salumieres. No, no — what we're concerned about here is how exactly the Puppy Bowl puppies are so compliant. Are they drugged? If so, what drugs and if I give them to my dog, will my dog be as well behaved as a Puppy Bowler? This year's contest in cute will also feature hedgehogs, and one has to worry that kittens or puppies, being vivacious little predators, would try to harm the poor hedgehogs somehow. Are the necessary precautions being taken? Is Cesar Millan taking them? Because I don't trust that guy. He doesn't seem like a friend to the hedgehog. 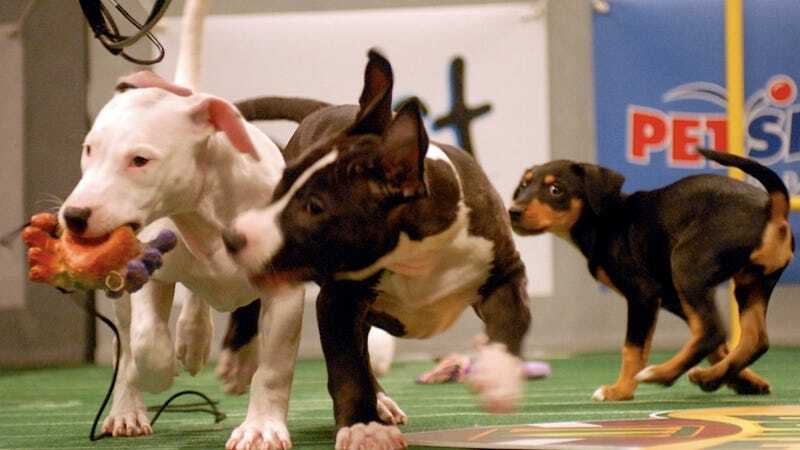 DROP EVERYTHING: The Puppy Bowl Starting Lineup Is Here! You cannot purchase a Puppy Bowl puppy or kitten because they are all up for adoption...on Mount Olympus. You think a puppy champion wants to live in your dingy apartment? Ha! The gods laugh at your naïveté. All the puppies and kittens come from shelters in the U.S. "Shelter," in this instance, is a euphemism for degree mill, a place where puppies can nominally enroll in class while they perfect their game for NCAA Division I competition. In order to be considered for the illustrious Puppy Bowl, puppies have to meet certain size and age requirements. They also have to be able to bench press 225 pounds at least twenty times and pass the get-ham-slices-off-of-a-waist-high-counter test that measures their vertical leaping ability. No breeds are barred from competing. Except prairie dogs — the rules have been very clear about prairie dogs ever since the great prairie dog debacle of 1987, when seven prairie dogs signed up for the Puppy Bowl roster and spent the whole game burrowing under the field. The Puppy Bowl is not actually a live television event. It is taped in November by a camera crew of Shaolin monks, the only people capable of concentrating hard enough to edit out footage of baby animals wrestling deemed not cute enough for game day. Sonic the Hedgehog will be performing the coin toss. Actually, no — Sonic the Hedgehog is a fictional video game character. And that, folks, is how Puppy Bowl magic is made. Sort of disappointing, isn't it? Learning new things always is. Best to keep your head down and watch a lot of television while questioning what you see as little as possible.